Dr. Provenzano, MD, is Clinical Professor of Medicine at Wayne State University in Detroit, MI. He is the immediate past Chair of the Division of Nephrology, Hypertension & Transplantation at St. John Hospital & Medical Center. Dr. Provenzano is currently the Vice President of Medical Affairs at DaVita where he oversees owned and management nephrology practices. Follow him @DrBobPro. No subspecialty (except Psychiatry) has more experience with depression than nephrology. We all know this, but the question is; what do we actually do about it? There is a major disconnect about what we know and what we do. Let’s start with the easy part, what we know. We know that many ESKD patients are depressed. Studies suggest 20% of males and slightly more females are clinically depressed (although these are very conservative numbers in my experience). We know that there are biochemical considerations and that lower delivered dialysis exacerbates depression. We know that depressed patients have higher hospitalization and mortality rates. We know that there are psychosocial issues that are handled or tolerated differently by each patient. We know that patients who are more physically active and/or who work are less likely to be depressed. I would posit that we also know that antidepressant medications are only marginally helpful and that dialysis providers, payers, and all of us nephrologists could develop better processes focusing on depression. We don’t really know if the psychosocial issues trump biochemical imbalances, yet we are quick to prescribe antidepressants. We have no strong trials guiding us here. So where does this leave our patients and us? ESKD patients don’t just suffer from the loss of kidney function, rather that loss is only the most recent and most obvious. 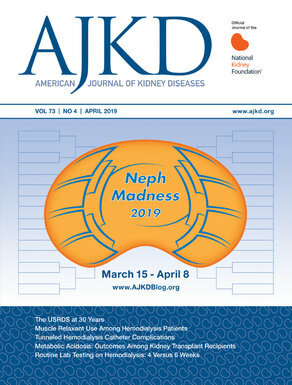 They have been “losing” long before they first presented to a nephrologist. Diabetes, ASHD, HTN serve as the core etiologies/co-morbidities of ESKD and have been robbing our patients of their independence, ability to work, sexual fulfillment, ability to engage meaningfully with their families, and self worth for many years. I suggest that nephrology/nephrologists prioritize depression for all that it is – a disorder robbing patients of meaning and quality of life. We should work with providers to develop systems of care to impact depression with measurable endpoints. We need to prioritize meaningful time we spend with our patients, pre-ESKD & ESKD to set expectations, to become sensitized to their condition, and to discuss continued employment, family dynamics, their fears, and also their goals. We must lead here and stop pretending that our patients’ depression is not our issue or not real or not important or, or, or. . .
Or, maybe just consider what you would want and need if tomorrow was your first day on dialysis. Read more about Depression in the Dialysis region.